Soundwear Performer bags also utilize a patented and unique design which keeps the bag in a stable and non-collapsed position, even when loading or unloading the instrument. 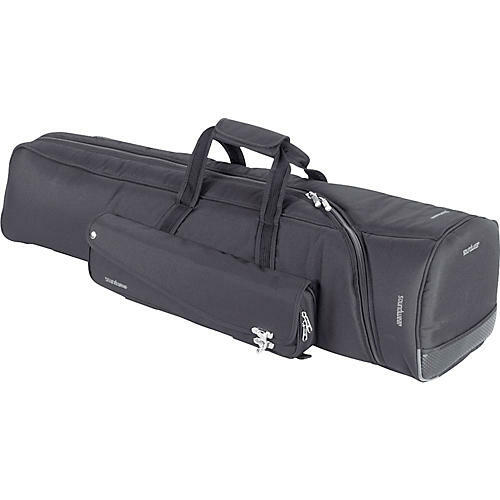 Additional features include a highly resistant waterproof polyester exterior and soft interior lining to preserve the instruments finish, a heavy duty zipper with over lapping foam to prevent scratching the instrument and padded aluminum insert for the slide. Solid hooks and rings, reinforced handles and a detachable backpack device all make carrying the instrument safe and comfortable. An exterior accessory pocket features compartments for care products, CDs and other necessary items and ultra soft velvet mouthpiece pouch.